There are nearly 200 students working on the personal projects. 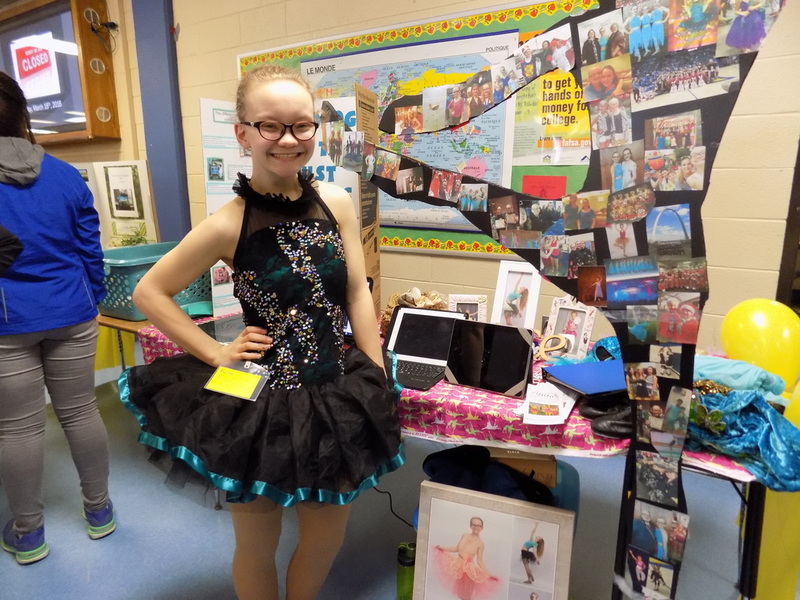 This project allows the sophomore students to show off their unique and diverse talents. “As humans, we never stop learning, no matter how old we are. We require students to complete this project because it is a perfect example of how learning truly occurs. It is through the process of trying to accomplish something that we acquire knowledge, not the final product or outcome itself.” -Marissa Wilkening, Personal Project Co-Coordinator. Each project portrays each students individuality and what they are interested in learning about. Kirstin wants to not only wants to progress in her dancing but son hopes to teach her own creative dances to other dancers like her. What inspired you to choose this as your personal project topic? Hoping to improve his photography skills over the course of time. Works of art through different colors and textures. Owning her own business, she hopes to take it to the next level. 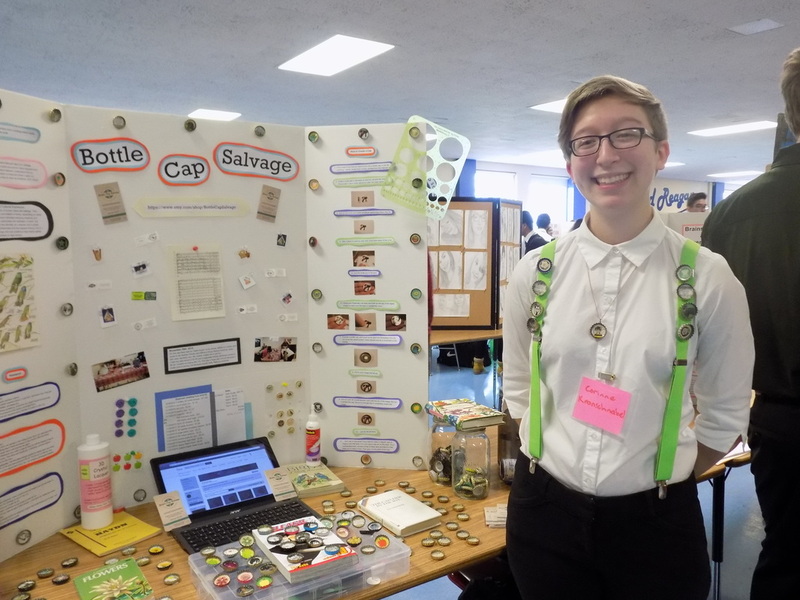 She so far is designing her own magnets, pins, and pendants made from recycled bottle caps. Spring is in the air, as they say, or more accurately, in the paint. March 20 marked the official start of the spring season, and the local art galleries have come to reflect that. In particular, two are currently displaying series of paintings depicting the natural world, in completely different ways, yet both are worth seeing. The larger of these exhibits currently fills a special place at the Milwaukee Art Museum, Nature and the American Vision is traveling on loan from the New York Historical Society, with several paintings coming directly from the Louvre in Paris. This exhibition features enormous canvases depicting vast natural landscapes, in incredibly minute detail and with attention to light. These paintings come from the Hudson River School, recognized as the first American art movement, in the early 1800’s. Painters of this era underwent grueling expeditions into untouched Western landscapes to find artistic inspiration. They then took the sketches and memory of what they saw back to their studios to paint over the course of months or even years. These works were very well laid out in a flowing, serene gallery. The ornate gold frames and soft toned walls echoed the time in which the artists lived, and the large spacing between them added to the calming atmosphere and feeling of solitude. The only detriment to this show was that after about 30-40 similar paintings of the same subject, the viewer begins to lose interest. However, this show is definitely recommended to anyone looking for a more meditative, stress relieving experience in the midst of upcoming end of semester projects and exams, on display until May 8. ​A much smaller but equally appealing gallery this month resides at the Tory Folliard Gallery in the Third Ward. Rodger Bechtold’s Remote Possibilities will be on display until April 9. These paintings again feature natural landscapes, but unlike the hyper-detailed works of the Hudson River School, Bechtold’s style is a blend of realism and abstraction, using vivid color and broad strokes to describe his subjects. A Midwestern native, Bechtold has been an accomplished landscape painter for over thirty years, even having studied with well-known artist Wolf Kahn in Santa Fe. The gallery presents his work in a much more simplistic, straightforward way than MAM’s American Vision, really allowing the artwork to shine through in a much more engaging way. Although small, this show is absolutely worth even just a quick walk-through. 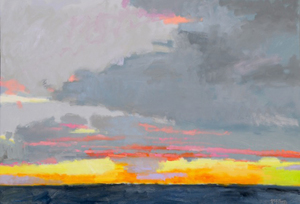 ​However different, both of these exhibitions do justice to the life and vibrancy of nature, and provide refreshing color to winter-worn Wisconsinites. All of the artists also seem to have a common message for the viewer, one that is best explained in the words of Bechtold himself: "I create landscape paintings that have a feeling of spaciousness beyond the limits of the canvas dimensions, charged with color, expressed with energy and seemingly effortless brushwork. But most of all I'm interested in communicating what it feels like to be there." As photography is prohibited in the Tory Folliard Gallery, all photos of Rodger Bechtold’s work are courtesy of toryfolliard.com. 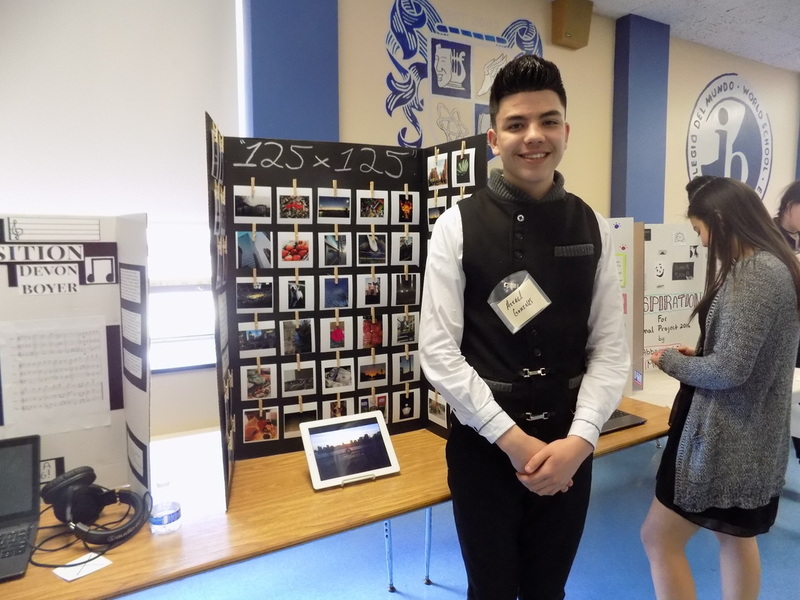 National History Day (commonly referred to as NHD) is a project done in a student’s sophomore year at Reagan High School. This was implemented last year as a requirement for all US History classes. Although this project may not appeal to everyone, it is a great opportunity to learn more and expand one’s knowledge. Every single student picks a topic and finds a way to tie it to the theme for the year. For those who may not know, there are several different types of project categories from which to choose. These include: websites, documentaries, papers, exhibits, and performances. From the beginning of sophomore year, students conduct research on their selected topic, and continue to work on this until the first semester final exam. In fact, this project takes the place of the exam. When told to give advice to someone who is about to start the project, sophomores begged people to not procrastinate. Alexxus Hart said,“...Choose a topic of interest and make sure you plan out your actions, so that you don't get stuck in a time crunch.” Ryan Oberdorf said, “...Choose a topic or event that is specific to one period of time. If you choose a subject too large that spans a lot for history, it is hard to research.” To get more help with the project, there are always teachers or even juniors or seniors who have completed the project that are willing to help. Reagan currently has 16 students who will be advancing to the state competition in Madison on April 23rd. These students are: Ryan Oberdorf, Hannah Smith, Ashley Roemer, Abigail Rasmussen, Angie Sielen, Shayla Finley, Amaya Leal, Keric Jackson,Sam Loontjens and Daniela Avila, Alexxus Hart, Estefania Gonzalez, Corrine Kronchnabel, Harrison Tremarello, Charlotte McLinden, and Lily Pachner. There’s also a possibility of 9 alternatives: Zack Jacher, Jazmin Cruz, Kennedy Wilcox, Emily Rasmussen, Julianna Gessner, Lance Baren, Gabe Hernandez, Toni Glessing, and Kirstin Hackbarth. Congratulations to all of those who have completed their projects, as well as those who are continuing to advice in the competition! Taken by: Ms. Holtgreive Pictured: (Left to Right) Keric Jackson, Jack Zacher, Hannah Bloor, Destiny Scott-Dyson, Sammy Hernandez, Tanya Puebla, Daniela Avila, Lance Baren, Gabe Hernandez, Luke Stoerger, Ryan Oberdorf, Harrison Tremarello, Chloe Weithofer, Alexxus Hart, Gabriela Casas, Aaron Woida, Malcolm Ramirez, Amaya Leal, Charlotte McLinden, Hannah (Avery) Talbott, Sam Loontjens, Josie Sielen, Anna Rasmussen, Jazmine Cruz, Angie Peraza, Salatiel Nieto, Juliana Gessner, Estefania Gonzalez, Emily Rasmussen, Toni Gleesing, Kirstin Hackbarth, Lidyanis Torres-Montanez, Hannah Smith, and Ashley Roemer. According to the American Red Cross, every two seconds somebody in America needs blood. In just one minute, that is 30 people throughout the U.S.A. that are in need of a blood transfusion. Reagan is continuing to make great efforts in assisting the blood demand in the community. The April 11 Reagan Blood Drive is quickly approaching, and it is one of the most critical blood drives Reagan has had. Although always a major event, Ms. Sato, science and CP coordinator who teaches anatomy and physiology, explains the urgency and cruciality of this approaching April 11 drive. “Hospitals are running low. Currently there is a blood shortage in the City of Milwaukee for pints of blood. Our next blood drive that we have in April is going to be very important,” she says. Ms. Sato currently coordinates the semi-annual blood drive as of the 2015-2016 school year. She came into this position after the previous coordinator, Mr. Reedy, retired just last year. “It’s important to give blood because people that get in accidents or have surgery need blood. If we don’t give blood then there won’t be any for them to get. Essentially when you’re giving blood you are helping somebody else out. It seems kind of removed because you don’t actually see the patient that’s getting the blood, but it really does help.” Ms. Sato states. American Red Cross says that around 38% of the American population is able to donate blood, though just 10% do. The most demanded blood type is O negative, as this can be transfused to any patient, regardless of their own blood type. This type is always in low supply, as it is used quickly when it is donated. If you are a Reagan student and at least 16, donating is an option with a signed parent consent form. For those 17 and older, donating without consent is available as well. To sign up, see Ms. Sato in Room 244. Ms. Sato believes Reagan is a school fit for this event for multiple reasons. “I think Reagan is a good place for the blood drive because students have that sense of community and they’re trying to help other people within not only our small community but also in the City of Milwaukee. I always hear back from the Red Cross that Reagan gets the most kids to donate and gets the most units of blood from other comparable schools.” She adds that Reagan’s IB curriculum instills the desire to give back. “I also think it has to do with IB and how the Learner Profile Traits include being caring and open-minded and just being able to give back. It’s a really nice way to do service hours within the school day.” That’s right, the blood drive counts for CAS hours for those in the full diploma or career-related programs! How does the process of giving blood work? If you have signed up for the blood drive, come April 11, student volunteers will collect student donors from their classrooms to come to the gym. First is the starting process of giving the donor’s personal information, such as background, age, weight and height. After, donors go to booths to meet with Red Cross staff and trained volunteers to ensure iron levels are high enough (checked with a finger prick) for the donor to continue through with the actual process of giving blood. If all requirements are met, donors will be brought to a bed to have the donation drawn. Ms. Sato says the process of giving blood varies from person to person, but will usually range from 20 minutes to an hour. “If anyone’s nervous about donating blood, I’d say to not be. It’s pretty painless. There’s students around who will talk to you or hang out with you if you want someone. We call them ‘buddies,’ so we have volunteers whose roles are to be a buddy and hang out with those who are donating blood. Also you have to think about the greater good you are doing for other people.” Along with the incentive of feeling good about helping others, there will be a food incentive! Ms. Sato added that cookies, juice and snacks will be provided to those who donate their blood! It is not too late to sign up! Remember, the City of Milwaukee is in a state of blood shortage, and you can be a hero! See Ms. Sato in Room 244 for questions and registration. With prom quickly approaching we want to know how prom will be. Here is an interview with a member of the prom committee on what prom will be like. Q: What can we expect from this prom? What is the theme for this year? A: The theme for this year's prom is gala at the museum which the goal for this theme is to be fancy. A lot of people were pushing for the theme to be Great Gatsby because they wanted the fancy live and vibe that came from that book but not many liked the title of the theme so we settled with Gala at the Museum. People can have their fancies and not be discouraged from the title of the theme. Q: How has planning of the prom gone so far? A: It's been going smoothly. We have our ideas settled it's just actually initiating everything to be put together for the big night. For instance the centerpieces are really nice this year and so it takes a bit more time to order everything and make sure everyone will be happy with it. Q: When and where will the prom be? A: Like all the posters say April 15 at 8 p.m. till 11 p.m. at the Italian Community Center. This is the last week for prom tickets so hopefully we continue to increase our population for the prom. Q: Are you personally excited for this year’s prom? A: I would say yes being that it is my first prom and I never really experienced a dance of this kind before. Q: Is there going to be a big turn out based on the tickets purchased so far? Whats a rough estimate of those commiting to showing? It’s that time of year again when millions of high school juniors and seniors gear up for one of their most memorable nights in their high school careers. Prom is the place where you have an excuse to buy that dress you’ve been eyeing for months or renting your first tux. Even though you’ll have the opportunity to take a spin on the dance floor and create lasting memories, what is prom without people to share it with? Whether it’s your best friend, new crush, or significant other, why not make the most of your prom experience? Yes, the dance will be worth it but shouldn't the asking be just as so? Here is a list of the cutest promposal ideas to fit everyone’s personality.